Your website on Zhibit.biz is a private space where you can display your products and services without annoying banners or ads. By all appearances this space looks like your own branded website with only minimal indication that it is hosted on Zhibit.biz, making it suitable to be your primary online presence. The features at all price points, the flexibility in design and the awesome customer service make this a really great product, much better than I had hoped for. Never lose business because your website is offline or too slow! Zhibit.biz's enterprise class technology renders your website faster than 95% of all websites out there (according to Alexa) with a 99.9% availability rate. 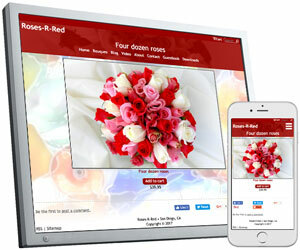 The responsive mobile-friendly design ensures your website looks great on desktop computers, laptops, tablets and mobile phones. Link your own domain name. A generous storage space means that your website can grow over time to include thousands of images and pages. Personalize your website by choosing from professionally designed arrays of themes and color schemes or do it yourself and choose your own colors, fonts and backgrounds. Protect your copyright with automatic watermarking of your images and Zhibit.biz's proprietary copy protection measures. With Zhibit.biz's website hosting platform, you get your website up and running in minutes by simply filling in a few forms and uploading images. And it's just as easy to maintain that website over time as new content is added or old content is removed. Zhibit.biz's self-administered, fully-hosted solution has the advantages of lower costs and greater control to you. You have made it quite easy to figure out some of the more complicated steps involved with web site set up in general that only a web site builder would know how to do. Some of these options you offer on the site I would have never been able to do on my own. No web design skills needed: easy to follow screens guide you through the process step-by-step. If you can browse the web, you can use Zhibit.biz. Assuming you already have your images digitized and your copy written down, your website can be online in 30 minutes or less. Still need help? Our top notch customer support is backed by our development team, not an overseas call center, guaranteeing the most accurate response to your inquiry. We respond to most inquiries within 24 hours and often faster. With its virtually infinite audience, the web has become one of the most important channels for businesses looking to gain exposure to their products and services. Your website is the center of your online presence and serves as a dynamic extension of your business card, allowing you to interact with your customers and respond quickly to market demands. A website that is optimized well for your key search terms will generate new business leads through web searches. Thanks to my website, I have received a number of contacts from clients who found me through search engines and other sites I'm on. They had the chance to look at my work, and the rest is positive marketing history! Being on Zhibit.biz is working fabulously! When you publish a website on Zhibit.biz, it enjoys our reputation with Google immediately. Combined with proven search engine optimization (SEO) techniques to help boost your site's ranking, it's no surprise that many of our subscribers rank highly for their key search terms within days of activating their site. Stay in touch with your customers with direct email marketing (guestbook), including opt-in/opt-out management and automatic addressee confirmation and verification. Zhibit.biz has paid for itself easily in increased sales since I have been listed. I receive many compliments on my web site and its ease of presentation. I couldn't be more satisfied. Link your PayPal merchant account and accept payments using all major credit cards, including American Express, Discover, MasterCard and Visa, or through PayPal. Sell directly to your customers with no mediation of Zhibit LLC and never any transaction fees. A shopping cart lets you accept orders for multiple items at a time. It can also hold items for your customers for up to 30 days giving them a chance to make up their mind and return later to finalize their purchase. Inventory is automatically updated for items that sell or run out of stock. Yes, it really is $1 a year for a basic website. Premium subscription plans, ranging from $5 to $15 a month, are available for those who need extra features, such as ecommerce, domain aliasing or site analytics. How can you offer this free site? I can't get over how great it is. 30 day money back guarantee: we will refund fully, no questions asked, any subscription payment for a period longer than one month when notified within 30 days of the date of the payment. Rate freeze guarantee: your rate will never increase as long as you stay on a particular plan, even if that plan is discontinued. No hidden charges: only a simple flat subscription fee, charged monthly or annually. No contract: cancel your subscription any time. And since you do it yourself, there is no web designer you have to wait on and pay through the teeth for each change. Changes are free, instantaneous and unlimited. In today's world an internet presence is more important than ever yet the technology for creating and hosting a website still eludes many due to its complexity and cost. Zhibit LLC was founded on the simple premise of empowering people to create a website as inexpensively and as easily as possible. We know you want to concentrate on that which you do best and not worry about designing your website, nor pay through the teeth to have a web designer do it for you. I don't feel like I'm dealing with an Internet company and that's very nice. Today Zhibit LLC remains a small shop. We believe it puts us in a position to be on your side rather than on that of a large corporation. We are attentive to what small businesses need because we are a small business ourselves. The services we offer on Zhibit.biz are the same ones we'd like to see ourselves. Your customer service is above and beyond and simply excellent. I hope you know what an incredible job you are doing. Having a website is a bit terrifying. You have removed all the fear out of the process and made it pain free. Thank you, thank you and thank you! I've always enjoyed what was offered by your website compared to other websites, and was pleased to find a company who's prompt about getting back to the clients. Thanks again and be pleased to know I plan to stay a member for quite a while. I just wanted to mention how impressed I am with your service. It's very easy to use, whether when posting new pictures or when maintaining existing ones. I am ecstatic with my new website and have received a lot of good feedback from clients and friends. Thank you so much for providing an easy, yet professional presence . I have looked at many start-up websites and find yours the most affordable, easy-to-use and professional. I could not be happier with your service! After several years of being miserable with my website and having no easy way to update information I am so delighted with what you have provided at such a reasonable cost. Thank you, I am a satisfied customer! I may be one of your more beginner computer people out there and I must say your system really is a good step by step hands holder- thanks. * Testimonials on this page are by subscribers of Zhibit.org, a sister-site of Zhibit.biz.